Sometimes there are things I hear in the knitting world that just make perfect sense. It’s the kind of thing you hear and you can never forget it and you wonder how you ever did things before. It’s like the construction of a top down sweater. It’s not that’s I’ll never knit a sweater top up again, just certainly not as often. One of the things I have picked up over the years, and people seem to like, is double pointed needle stitch distribution. 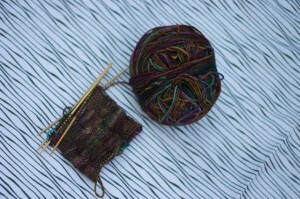 It works for anything you are knitting in the round but I find it most helpful for socks and mittens. Here’s the big secret: put half of your stitches on needle one, and distribute the other half over needles two and three. So, if you have 60 stitches you’ll put 30 on needle 1 and 15 on needles 2 and 3. Alright, I know this sounds pretty simple (and it might not be all together earth shattering) but I’m telling you, it makes life so much easier! First of all, you can avoid those pesky stitch markers, which can’t really mark the first stitch of the round unless it’s in the middle of the needles, which it pretty much never is. If you are knitting in the round on circular needles stitch markers are essential and helpful, but they just get in the way on double points. The beginning of the round is always the start of the ‘big’ needle (the one with the most stitches). Simple right? For socks this system is great because the top of the foot is always on needle one, no ladders on the top of the foot where everyone will see. For fair isle mittens this is great because 1/2 of the pattern goes on needle 1 and the other half goes on the other two needles. This way you know if you’ve made a pattern mistake halfways through, instead of having to rip back an entire round. 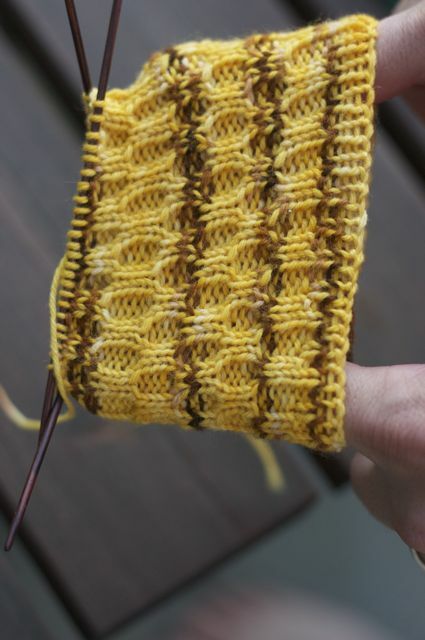 So, next time you are knitting away on your double points, give this method a try, you won’t go back! This entry was posted on Friday, October 15th, 2010 at 10:44 am	and is filed under Uncategorized. You can follow any responses to this entry through the RSS 2.0 feed. Both comments and pings are currently closed. Double point needle tips…I so love this…why didn’t I think of this…thank you!